Where can I see old post boxes? There are several good places to see preserved post boxes in good numbers. Most of the institutions listed here are open to the public regularly and I have NOT listed the other private collections in existence. So you want to know more about British Post Boxes? Why not visit the website of the group who REALLY know? 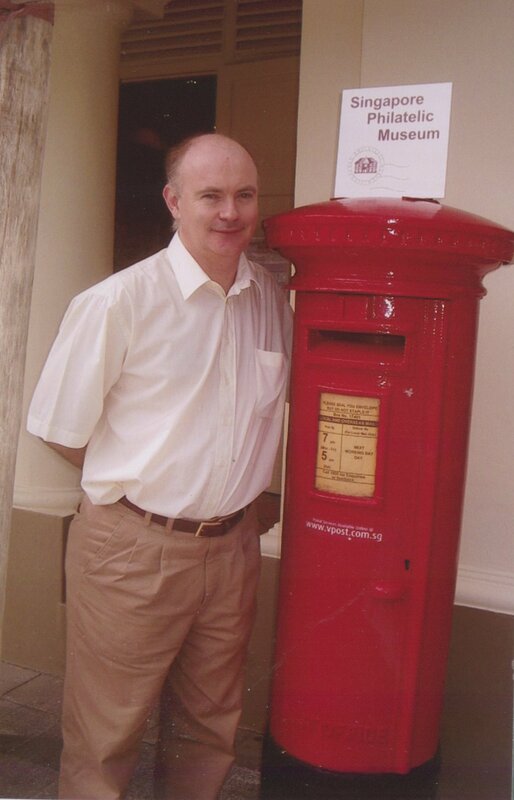 The Letter Box Study Group is the acknowledged authority on the history, reporting, identification and classification of British Post Boxes. For physical artefacts, it is hard to beat The Postal Museum (Formerly the British Postal Museum & Archive - BPMA). The Postal Museum houses Britain's national philatelic collections and has an unrivalled collection of postboxes both at their superb new museum HQ, open daily, at Calthorpe House in London and at the Museum Store in Loughton, Essex, which can be viewed by appointment. run by the affable Arthur Reeder and his lovely wife, Kim. Their collection now runs to well in excess of 200 boxes and is set in a lovely rural garden between Ryde and Newport, well worth a visit. If you have Google Earth - try searching for their garden, you can see the pillar boxes! Bruce Castle Museum, Tottenham, London includes a rare VR fluted pillar from Lyndhurst. This was the CWU collection, now denuded to just three pillar boxes. Oakham Treasures Collection, Gordano, Avon Houses the collection formerly owned by David James of Taunton, now deceased, running to 75 boxes including some of the very finest early examples. Great Central Railway Lougborough. Inside the Gresley TPO set at Swithland Sidings, is a very good collection of Lamp Boxes and a Ludlow. Unfortunately you need to be there on a Mail By Rail weekend when the TPO set is stabled at Quorn, to gain access to this collection. Amberley Working Museum, Sussex has a Vermillion Giant TK31/K4 at Amberley, EviiR A size pillar, GR wall & lamp boxes and various other postal and telephone related objects. Recommended. Carlton Colville - East Anglian Transport Museum, Norfolk The East Anglian Transport Museum near Lowestoft has a superb Street Furniture and Post Office collection in addition to trams, trolleybuses and narrow-guage railways. The highlights are A size VR pillar 1887 (seen above with the Type K1 Mk2 stamp machine) and a very rare WB83/5 Eagle Foundry wallbox. In addition there is a K1 telephone kiosk and two RAC kiosks! Well worth a visit! East Lancashire Railway, Bury, Lancs Vermillion Giant TK31/K4 at Bury Bolton Street station. Severn Valley Railway, Bwedley, Worcs Vermillion Giant TK31/K4 at Bewdley station, Penfold replica at Kidderminster. Manchester Transport Museum , Cheetham Hill PB29 E type pillar with built-in SVM. East Somerset Railway, Cranmore Vermillion Giant TK31/K4 at Cranmore East station. where you will also see a Second National Standard (WB75) wallbox at the main entrance. Cotswold Motor Museumno less than 9 AA Village signs! Coventry Transport Museum- Excellent petroleumania collection. Ipswich Transport Museum- 11 AA village signs! Highly recommended if you are in Singapore on business or vacation is the Singapore Philatelic Museum on Coleman St. 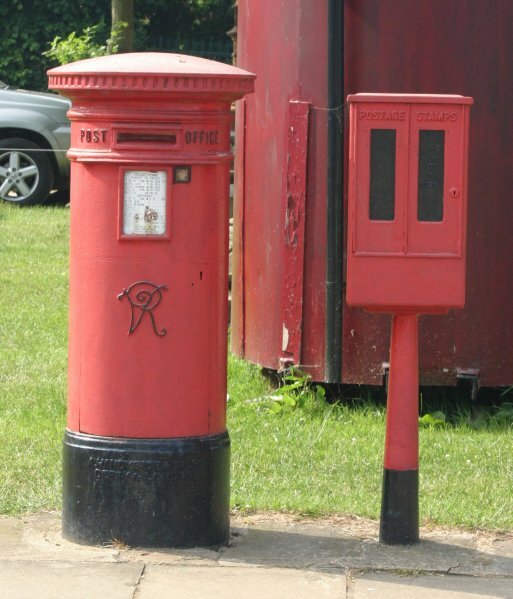 They have two EiiR pillar boxes and several lamp boxes in their collection, in addition to a good selection of locally-made boxes in different liveries. They also have a very well-stocked shop and knowledgable staff who are most helpful and can point you to the remaining Colonial-era boxes in the City. The two best known British boxes are at Table Mountain summit (an EviiR Type A pillar by Handyside) and on the University of the Eastern Cape campus - an early horizontal aperture fluted box by Smith & Hawkes from 1857. The later is the oldest post box in Africa. Inside the Forte Crest Hotel in Georgetown, British Guiana,is the only surviving British design Penfold in the Americas. Many more later colonial boxes are still on the streets here and in Trinidad & Tobago. Barbados, Caymen and Bermuda all have British boxes on the streets. In Montevideo and La Colonia are nine genuine Uruguayan Penfold postboxes made in the UK in the mid 1860s by Cochrane Grove & Co. The best preserved is in the Uruguayan Philatelic Bureau offices. 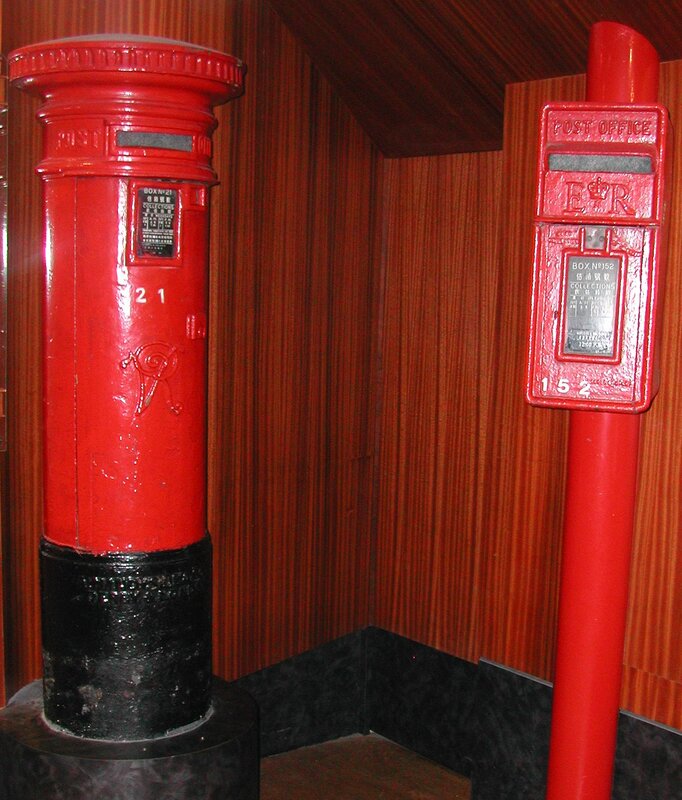 Very few colonial era boxes are left now, but one D-type Scottish Crown pillar remains in use in Central (right), an 1887 Jubilee pillar is inside the HQ of HK Post with this Carron LB216 (left). 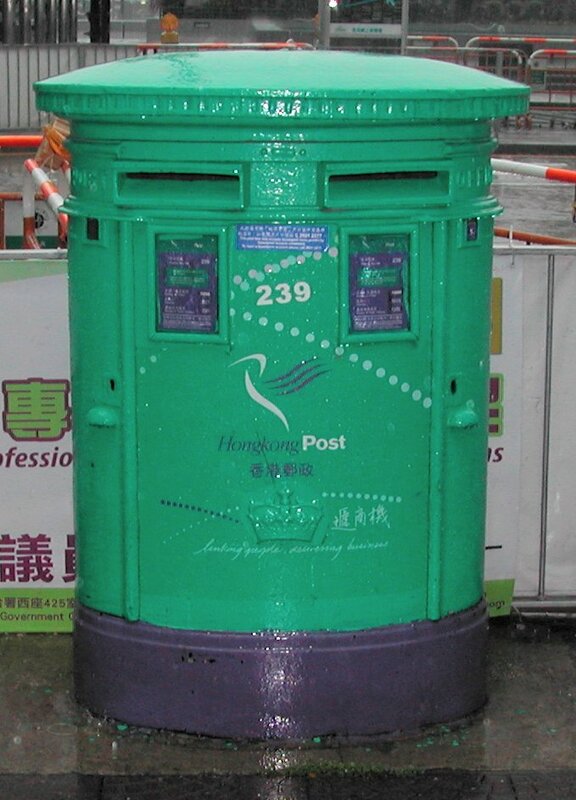 There is a dedicated team of local postbox recorders in HK led by Mr Sin Wai Man, Captain of the Hong Kong Postbox Search Team (http://hksearch.weebly.com/) who also maintains an excellent interactive map site: "Hong Kong Old Postboxes Map"
http://g.co/maps/q8366, which provides locations and photos of the surviving 59 royal-cipher bearing postboxes. A new Postal Museum is planned by the SAR Postal authorities. Union Street, St.Peter Port,Guernsey is home to Pillar Box No.1, the only surviving Vaudin box still in-situ. Inside the Central Market and at Fort Regent, both in St.Helier, are the only Penfold boxes in the Channel Islands. Onchan TSO is home to one of two PB29s. The other is also in Douglas, near the main Post Office. There is a replica Penfold on the platforms of Douglas Station. The Folk Museum at Daingean County Offaly has a National standard and a Penfold - both in red. These are the only red boxes left south of the 1922 border. The newly refurbished GPO building on O'Connell Street houses a History of An Post display which has the only surviving Ashworth of Burnley PB1, whilst the only Economy London Ornate is to be found inside the Kent Railway Station in Cork.